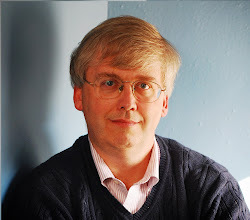 CONVERSABLE ECONOMIST: A Fiscal Crisis: Top Concern for 2014? "The risk of fiscal crises features as the top risk in this year’s Global Risks report. ... [M]ost emerging markets were able to quickly recover from the recent financial crisis. 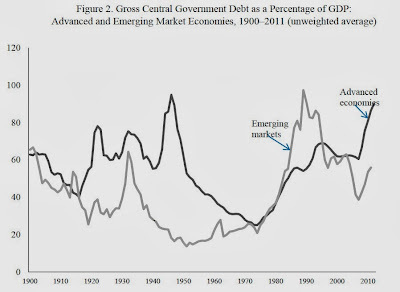 Latin American and Asian countries, which had experienced their own fiscal crises in the 1980s and 1990s, had implemented reforms to bring government debt under control. When they were hit by the fallout of the financial crisis, they had the fiscal leeway to stimulate economic activity through the opposite of austerity – increasing spending and/or cutting taxes. Advanced economies remain in danger of fiscal crises. Given the US’s official public debt of more than 100% of its GDP, and Japan’s of more than 230%, investors may at some point conclude that these levels are unsustainable. In the short run, the risks are higher for eurozone countries, which lack the option of devaluing their currencies to ease the necessary fiscal adjustment. Although ostensibly in a better position, many emerging markets have seen credit bubbles in recent years that could turn into financial crises, and then fiscal crises, for example, the rapid credit growth in Asia since 2008. ... Making fiscal frameworks more resilient in the future is even more important given the substantial longer-run fiscal challenges created by an ageing population." To put some meat on the bones of that capsule description, I recommend "Financial and Sovereign Debt Crises: Some Lessons Learned and Those Forgotten," written by Carmen M. Reinhart and Kenneth S. Rogoff as an IMF working paper (WP/13/266, December 2013). As a starting point, here's gross government debt as a percentage of GDP, looking separately at advanced economies and emerging markets. 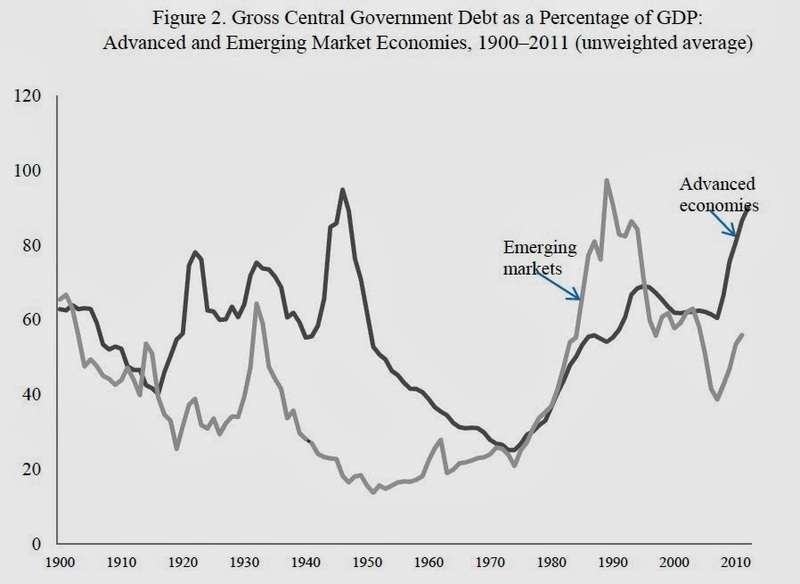 The emerging markets had a surge of government debt in the 1980s, but since then, the growth of their economies has largely outstripped the growth of their debt The governments of advanced economies have been growing their debt/GDP ratios, with a few hesitations, since the 1970s, and are close to matching their post-World War II high. But debt already owed by the government is not the only important measure of debt in an economy. When an economy has "external debt" owed to foreign investors, but has difficulty repaying, it has been common for the government to step in and assume some of that debt (fearing that otherwise the country might find it hard to access international capital markets in the future). Similarly, when certain kinds of private-sector debt, like banking debt, get so high that a default is imminent, it has also been common for governments to step in with some kind of a bailout. So what do these measures of debt look like? 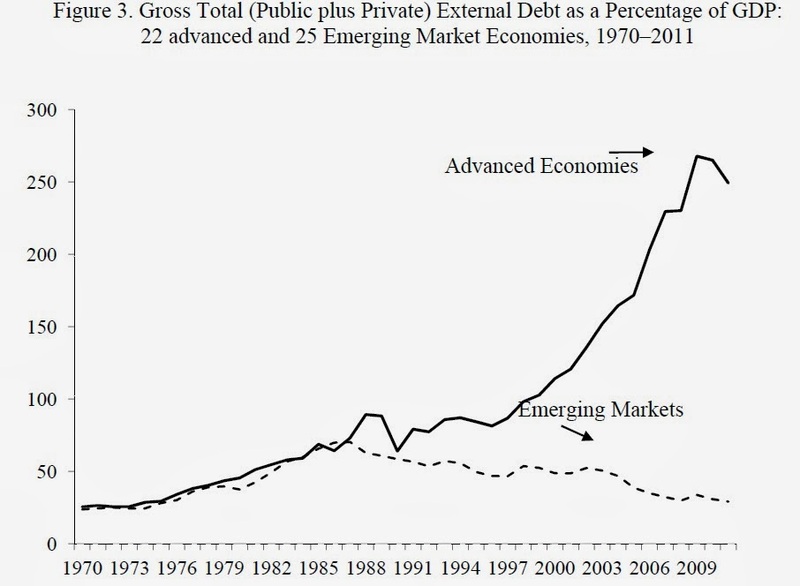 Here's a figure showing external debt--public and private--as a share of GDP. For emerging markets, the percentage is declining; for high-income economies, it's been climbing for most of the last 25 years. 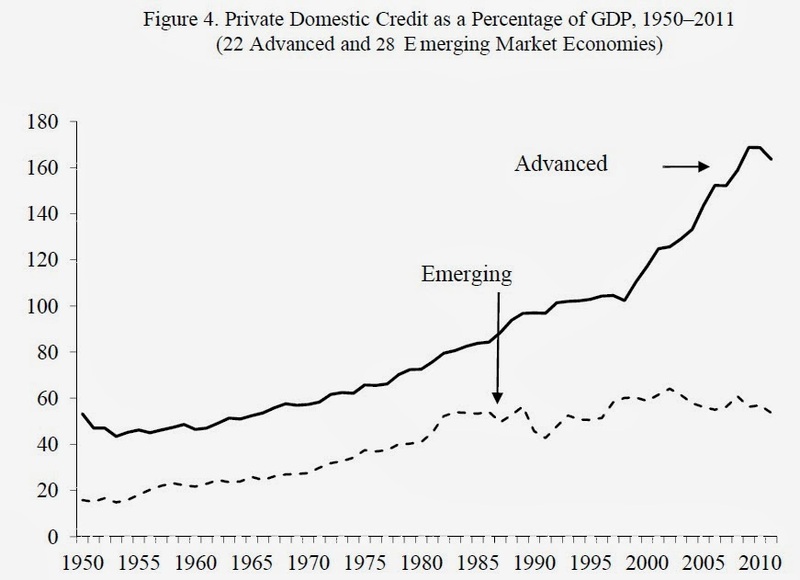 What is we just look at private-sector credit as a share of GDP? 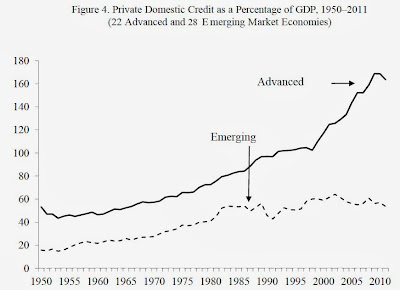 For the emerging market economies, private credit as a share of GDP has been basically flat since the 1980s. For advanced economies, the ratio has been growing over time, but expecially took off in the late 1990s--at least before the Great Recession mildly deflated the private credit bubble. The theme of these figures is that the size of debt in advanced economies, relative to the size of their GDP, is historically at high levels. This certainly doesn't mean that there will necessarily be a crash in the near future. But a high level of debt can make an economy more fragile when a nasty shock comes along. 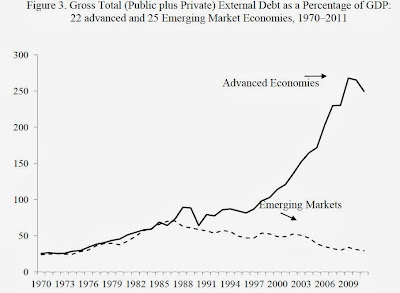 If the what Reinhart and Rogoff call the "debt overhang" is to be reduced, how might that happen? They lay out five possibilities. The happy outcome would be a surge of sustained growth across the advanced economies that would help the growth of their GDP outstrip the growth of their borrowing. If we don't want to count on this happy outcome, the other possibilities are less cheerful. Fiscal adjustment is a sustained pattern of lower spending and higher taxes to pay off the debt. A Greek-style default or restructuring would reduce the outstanding debt. An unexpected hit of inflation could reduce the value of the outstanding debt, although it might bring other undesired consequences as well like higher nominal interest rates while refinancing the remaining debt. The final option is "financial repression," which is the catch-all term for rules that limit how the private sector can invest, and thus make it easier for the government to borrow money. None of these options are attractive. But when an economy has run up very large amounts of debt, the good option--minimizing the debt run-up in the first place--has already been forsaken.